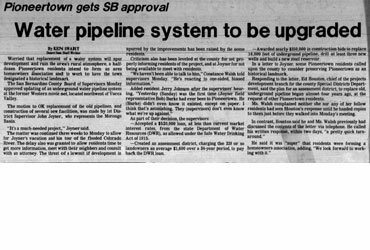 SAN BERNARDINO – The County Board of Supervisors on Monday agreed to join three Morongo basin water districts in a project aims to bring Northern California water into the area by way of a pipeline from the California Aqueduct in Hesperia. 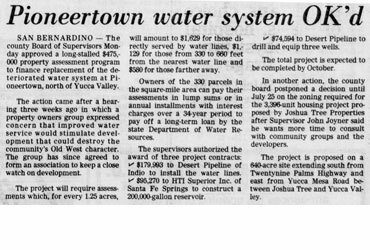 The supervisors approved an agreement under which the county would be a partner in the proposed Morongo Basin Joint Powers Authority with the Hi-Desert Water District at Yucca Valley, the Joshua Basin Water District Joshua Tree at the Mojave water agency. 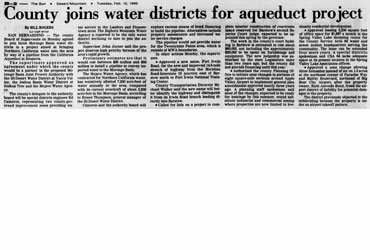 The county’s delegate to the authority board will be special districts engineer Ed Cameron, representing two county-governed improvement zones providing water service in the Landers and Pioneertown areas. The Bighorn Mountain Water Agency is reported to be the only water district declining to date to join the authority. Supervisor John Joyner said the project deserves high priority because of the areas rapid growth. Preliminary estimates are that it would cost between $38 million and $50 million that to install a pipeline to convey imported water to the Morongo Basin. The Mojave Water Agency, which has contracted for Northern California water, has a tentatively allotted 7,250 acre-feet of water annually to the area, compared with its currents overdraft of about 3,500 acre-feet in the Morongo Basin, according to Ernest Thompson, general manager of the Hi-Desert Water District. Cameron said the authority board will explore various means of bond financing to build the pipeline. Alternatives include property assessments an increased water service charges. The pipeline would not provide water for the Twentynine Palms area, which is outside of the MWA boundaries. Approved a new name, Fort Irwin Road, for the new and improved 14.3-mile stretch of highway from Meridian Road-Interstate 15 junction east of Barstow north to Fort Irwin National Training Center. County Transportation Director Michael Walker said that new name will better identify the highway and distinguish it from it’s Erwin Road branch leading directly into Barstow. Call for bids on a project to complete an interior construction of courtroom space reserved for Barstow’s second Superior Court judge, expected to be appointed this spring by the governor. Don’t work in the Counties court building in Barstow is estimated to cost about $60,000, not including the approximately $20,000 to be spent on the furnishings and equipment. New judgeship was authorized by the state Legislature more than two years ago, but the county did not provide financing until this year. Authorized the County planning office to initiate zoning changes in portions of eight-square-mile sections around Apple Valley Airport to implement general plan amendments approved nearly three years ago. A planning staff’s spokesman sent most of the changes, expected to be ready for a hearing this by this summer, what substitutes industrial and commercial zoning where properties are now limited to low-density residential development. Approved leasing 2250 square feet of office space for $1,687 a month in the Spring Valley Lake shopping center for the County Service Area 64 water and sewer service headquarters serving the community. The lease can be extended four more years. A special district spokesman said CSA 64 lacks adequate space at its present location in the Spring Valley Lake Association offices. Approved a zone change allowing three homesites instead of six on 1.5 acres at the northeast corner of Paradise Way in Maltby Boulevard, northeast of Big Bear City Airport, after the property owner, Ruth Azevedo Bond, freed the airport district of liability for potential damages to the property. The district previously objected to the subdividing because the property is under an airport takeoff pattern.